Needless to say, this site is all about finding cheap flights, but it’s also about having a cheap vacation overall. In some cases, one of which I’ll be discussing today, you can actually save a lot of money by paying more for a flight to a cheap part of the world compared to finding a cheap flight to an expensive place. Bangkok is a perfect example of this because it does tend to be a relatively expensive flight from North America or Europe, obviously because it’s a long way to go, but once you get there things are so cheap that you can easily get by on half or a third of what you would in most closer places. 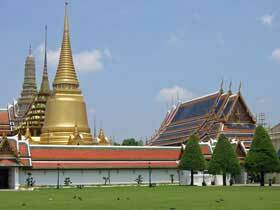 Right now you can get flights from Los Angeles to Bangkok starting at around US$840 round-trip. While that’s a bit more than it costs to go to, say, Paris, it’s only a bit more, and once you are in Thailand you can live in luxury on far less than it costs to backpack in Europe. For example, hotels in Bangkok are relatively expensive for Thailand, yet you can still find a room for around US$25 per night that isn’t bad at all. If you are willing to spend more like US$60 per night you can actually get something with 4-star amenities. Better still, if you go anywhere in Thailand (except for Phuket, which is also fairly expensive for Thailand), things will be even cheaper. Many people fly into Bangkok and then take a train to Chiang Mai up in the north, which is one of the world’s great travel bargains. In Chiang Mai you can literally get a nice hotel room in the city center for under US$10 per night. And for $40 per night you can get something quite luxurious. Another great side trip from Bangkok is to Siem Reap in Cambodia. It’s about 7 hours away on the bus, and these are very nice VIP 2-level buses, and then you are at the Angkor Wat temple complex, which is one of the world’s great sights. In Siem Reap you can get a hotel room for $20 that is of 2-star standards, and if you pay more you can get something really special. Just imagine what you’d pay for a hotel room in Hawaii, and cut the price down by around 80% or even more. So hotels are very affordable in and around Bangkok, but so is almost everything else. You can famously get a delicious meal from a street stall in Bangkok for around $1, or something similar in a sit-down restaurant for around $3. In Chiang Mai and Siem Reap things are even a bit cheaper, and alcohol is as well, especially in Siem Reap, where US$0.50 happy hour specials are found all over. If you only have a week then you might be better off flying somewhere closer, but if you can spend at least 10 days on a trip you can save a fortune by actually flying farther to a cheap place.